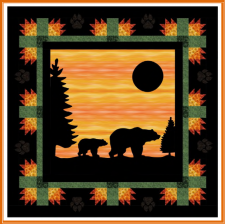 Some quilt designs are just so fabulously artistic they take your breath away, and today's feature is one of those. The Evening Stroll quilt was designed by Christine Stainbrook of Project House 360 for RJR Fabrics, and while you may have trouble finding the exact prints the design features, we are quite sure you'll be able to recreate a very similar look. This is a great project for any level of quilter. Enjoy!